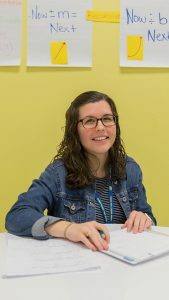 Rebeka Townsend ‘17 will take her passion for mathematics education into the high school classroom this fall, with a goal for helping students overcome their challenges. The college has a strong reputation for developing well-prepared teachers. Many of the math education methods courses offered here were not offered at other institutions. I also knew the college would provide me with a smaller family-like atmosphere within a large university. I had an incredible math teacher in high school that frequently told me that I would make a great math teacher. I added on an ESL licensure to my degree after traveling to El Salvador with my church between my freshman and sophomore years. This trip showed me what many of the immigrant and refugee students that come to our schools face in their home countries. I wanted to be prepared me to meet their needs in the mathematics classroom. Every student has the ability to learn and should have the opportunity to learn. Students come to school with a variety of challenges to overcome whether it be their family life, financial stress, bullying, language difficulty, a physical or mental disability, etc. I have been consistently shown how to help students work through their individual challenges and provide them with resources and appropriate accommodations to facilitate their academic and personal success. I’ve also learned the importance of having a strong support system within the world of education. Throughout my four years at NC State, I had professors, classmates, advisors and friends that I knew I could turn to in challenging and difficult times. My professors and other experienced educators have reminded me these past few semesters that teaching is a profession that is continually filled with challenges and difficulty and teachers will easily burn out without an effective support system. My experience in moved me from wanting to be a teacher because I liked math to wanting to be a teacher because I love working with students and helping them overcome challenges. The College of Education has developed me not only as an educator, but also as a community leader and advocate.